Pregnancy does not automatically damage your teeth. The old wives’ tale that warns a woman to expect a lost tooth for every baby is false. If the mother’s intake of calcium is inadequate during pregnancy, her bones – not her teeth – will provide the calcium her growing baby needs. This calcium loss is quickly made up after breastfeeding is stopped. However, the demands of pregnancy can lead to particular dental problems in some women. With proper hygiene at home and professional help from your dentist, your teeth should remain healthy throughout pregnancy. Dental disease can affect a developing baby. Research has found a link between gum disease in pregnant women and premature birth with low birth weight. Babies who are born prematurely may risk a range of health conditions including cerebral palsy and problems with eyesight and hearing. Estimates suggest that up to 18 out of every 100 premature births may be triggered by periodontal disease, which is a chronic infection of the gums. Appropriate dental treatment for the expectant mother may reduce the risk of premature birth. Brush your teeth at least twice daily with fluoridated toothpaste. pregnancy epulis or pyogenic granuloma – a localised enlargement of the gum, which can bleed easily. This may require additional professional cleaning, and rarely excision. If you have gum problems during pregnancy, it is important to get your gums checked by a dentist after you have given birth. 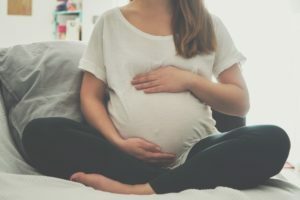 While most types of gum problems caused by pregnancy hormones resolve after birth, a small number of women may have developed a deeper level of gum disease that will need treatment to resolve. Pregnancy hormones soften the ring of muscle that keeps food inside the stomach. Gastric reflux (regurgitating food or drink) or the vomiting associated with morning sickness can coat your teeth with strong stomach acids. Repeated reflux and vomiting can damage tooth enamel and increase the risk of decay. Rinse your mouth thoroughly with plain tap water. Follow up with a fluoridated mouthwash. You might have an increased gag reflex while brushing your teeth. Some pregnant women find that brushing their teeth, particularly the molars, provokes the gag reflex. However, you risk tooth decay if you don’t brush regularly. It may help to close your eyes and concentrate on your breathing. Try other distractions, such as listening to music. If the taste of the toothpaste seems to provoke your gag reflex, switch to another brand. Alternatively, brush your teeth with water and follow up with a fluoridated mouthwash. Go back to brushing with fluoridated toothpaste as soon as you can. You might have food cravings while pregnant. Some women experience unusual food cravings (and food avoidance) while they are pregnant. A regular desire for sugary snacks may increase your risk of tooth decay. Try to snack on low-sugar foods instead. If nothing but sweetness will satisfy your craving, try to sometimes choose healthier options such as fresh fruits. Rinse your mouth with water or an alcohol-free mouth rinse, or brush your teeth after having sugary snacks. Increase your calcium during pregnancy. You need to increase your daily amount of calcium during pregnancy. Sufficient calcium will protect your bone mass and meet the nutritional needs of your developing baby. Good sources of dietary calcium include products such as, milk, cheese, unsweetened yogurt, and calcium-fortified soymilk. Increase your vitamin D during pregnancy. Vitamin D helps the body to utilize calcium. Good sources include, cheese, fortified margarine, fatty fish, such as salmon and eggs.